Today was the day when California's budget problems went from bad to worse. Since legislators have yet to produce a solution to California's $42 billion dollar budget deficit, state money has now completely stopped flowing outward. Declaring itself officially broke, the state government will begin issuing IOU's instead of check for grants, schools and any other organization or program which was previously receiving funding. Additionally, your California income tax refund check this year will not be sent out until after a balanced budget is passed. Those who have already filed their taxes will get an announcement noting the delay. There may be some, especially Republicans, that take some schaudenfreude pleasure in seeing the great state bankrupt, but the 8th largest economy in the world doesn't go down in a vacuum. This will effect everyone in the world. First of all, what does it mean when we say California is broke? The most publicized consequence is that residents of the state won't get their tax refunds. Another consequence is that college grants from the state will stop being paid out, thus threatening the future of students in the state. However, the worst effects will be felt elsewhere. It'll be felt at the county level. Sacramento County officials estimate a $32.2 million loss per month due to California deferring health and social services payments, which started Sunday. Payments include most state programs mandated by state law, including local mental health, alcohol and drug payments programs. Public assistance for individuals and families would also be significantly reduced without state fund support. Additionally, payments to adult protective services, child protective services and in-home support services would be held up. In other words, for the social safety net in California, this is like a neutron bomb going off. Medi-Cal payments have now been stopped. Contrary to traditional conservative thought, the social safety net is not the root cause for California's ballooning budgets. Instead the heart of this dysfunction has a more easily identifiable source. The fastest-growing segment of California's deficit-ridden budget, by far, has been its prison system, reflecting severe overcrowding, generous labor contracts and federal court pressure to reform inmate health care. "Corrections," an ironic misnomer, has jumped from less than $5 billion a year to more than $10 billion in the last decade, over twice as fast as school spending, the biggest budget item. It now costs about $45,000 a year to feed, clothe and medicate each of the state's 170,000-plus inmates, or roughly five times what taxpayers spend on a typical public-school student. And that doesn't count what it costs to supervise tens of thousands of parolees. California has the largest prison system of any state in America, with 171,500 inmates. This is largely due to harsh prison sentences for non-violent offenders, the famous 3-strikes law, and most of all, the parole system. 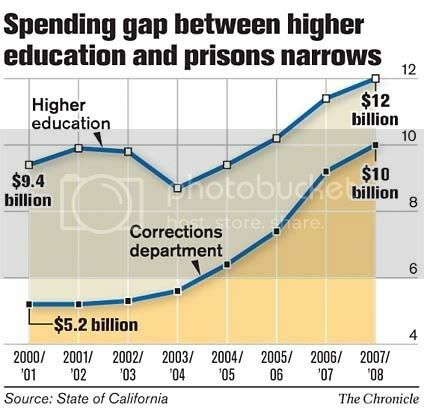 The cost of the prison system has nearly surpassed the cost of funding higher education in the state. It's a sad statement about priorities. The budget problems also effects anyone who does business with the state. In anticipation of state IOUs, contractors are cutting hours for subcontractors or idling them, scrapping equipment orders and hoarding cash, Berg said. For some the measures may be too little too late. "If you've done $5 million worth of work and you're waiting for a paycheck, that'll put some of the biggest contractors out of business," Berg said. This is, of course, the worst possible timing. The state economy is melting down, which causes the tax revenue to drop, which causes the state to not be able to pay its bills, which causes contractors who deal with the state to shut down, which causes the economy to melt down more, etc. If the budget situation is not resolved this month, the California will begin defaulting on its debts. The Governator has responded by making state workers take unpaid days off. This is a more symbolic gesture than anything else because even if the Governator fired every single worker in California, it still wouldn't balance the budget. However, it does add the number of people with a smaller paycheck in the state, thus slowing the economy further. California has a $42 Billion budget shortfall, by far the largest of any state in the union. This is mostly due to the real estate bust. Along with Florida and Nevada, California was at the heart of a real estate bubble that left the orbit of reality several years ago. The state's budget problems have now earned the state the dubious distinction of having the worst credit risk in the union. What this does is raise borrowing costs, forcing budget problems into future years. The other factor of the budget stalemate has been the political side. Republican politicians have decided that now is the time to resurrect old partisan battles. GOP lawmakers have tugged old battles over workplace rules and the environment into the historic winter budget talks now underway in the Capitol. From the position of the majority Democrats, who need at least a few Republican votes to pass a spending plan, it pays to listen. Back on the table are some of the most hard-fought policy issues of recent years, won by Democrats and Republican Gov. Arnold Schwarzenegger: labor rules on overtime pay and work breaks, plans to clean up the dirtiest diesel construction equipment and California's curbs on greenhouse gases. The California Constitution says that any budget must get passed by 2/3rd of the legislature. The Republicans have been in the minority for a very long time, but when it comes to budget time they hold nearly as much power as Democrats. If a new budget proposal for spending caps is approved then the spending cuts would have to be nearly doubled. California isn't alone in this crisis. A quick Google search will turn up news articles about massive state budget cuts from Nevada to New York to South Carolina. Any TAX increases must be approved by a 2/3's majority. This is usually where the Prop 13 argument shows up. Shall I squash it now? At this point in time CA real estate is a bust. Changing the tax laws on real estate in this state is a losing proposition. ...close both the prisons and the university system you would only close half the budget shortfall. These programs are classic examples of '...Democratic spending gone wild...' according to the Republican 'Terrorist' Party. That state is so bogged down in political favors, games, with money they cannot see straight. I did a little post (which I regret) showing 20% of the US prison population are illegal immigrants but also we had an unbelievable number of people in prison, 2.3 million! That's ridiculous and if they are in there for drug, non-violent crime (theft is another story) but they should immediately have a rehab program together and plain get those people out of there if they clean up. while everyone wants to be PC, these are the harsh economic realities of taking on the worlds poor in a domestic economy. Now Mexico sounds like some sort of war hell zone....so now they might be even further refugees but it sure seems to me to be a no brainer to get the felons, the gangs, the drug syndicates out of the country and make it a priority. Then, on their health, where are the free clinics, where are the smaller, more cost effect means to get health care for the uninsured besides the emergency room? I mean that state will not face economic reality...relying on a housing bubble to avoid the impending implosion, how stupid is that? They are going to lose their business base. It's so expensive to do business in California, I have no idea how they have hung on to a lot of it. If I get a base salary in CA of $100k, I can rent a glorified tenement closet. If I get a base salary in TX of $100k, I can buy a 4 bedroom, 3 bath home, no problem. When i left Calif. 9 years ago i saw a morally corrupt state already 1 billion in the hole , it only cost me 700 dollars to leave that state and i was a life long resident born and raised there it only took me 2 seconds to leave California out of survival, im not surprised that in the 9 years since i left that the liberal cash spending fiends that are running and ruining California have managed to burn all their businesses and tax payer's to the point where they were leaving in the last 6 years so fast that the AFDC rolls looked like they growing when in fact it was that the ratio of people on assistance were catching up to the employed 1 in 9 are on it so who's paying for California's insane mismanagement well you are, all the working Californians whats left of them, did you know it costs 3,800 to move out of Calif right now but it only costs 600 to move to Calif, to me it says they need your money bad and the u-huals are in short supply' I know you probably think what a right winger i must be, but to tell you the truth im just a mom with 5 kids and conservative with my budget. no debt and i work for a living i never took any hand outs and never expected one either there is no free lunches in life if you want to have success and self esteem in the same sentence, as for the social services programs California has gone so far to the left of reality with all the illegal immigration excesses an excuses and people fully capable of working that get handouts, its why i left i saw this was going to hinder my own family's future i didn't want that free love liberal to excess passive attitude to all that's corrupt instilled into my future my children. good people of California you may soon consider the same leave before its too late and the corruption in this once golden state takes you too, with outrageous taxes, haters, hypocrites, political divisiveness, lack of personal responsibility & now recently the gays not even supporting their own tolerance mantra by bashing certain straight folks for a personal conviction when asked, im so glad i left this boiling cesspool of political agendas and selfish virtue less profiteers and im sure if any of this offends you, then you are glad i left too & there is no offense taken here, your thoughts are your own, i just never did belong in a place that suffers so much at the hands of a morally corrupt local,state & Fed gov, that allows left thinking groups to have all the concessions while gagging and blindfolding others who are asked to pay for it all the while being called the hypocrites for asking a simple question like why do i have to pay for those who don't do anything but whine where is the money going, who are they kidding. its a case of the state embezzling its corporate funds and not being held accountable to the people who pay them the TAX PAYER but then i have never seen any politician held to the standard they swore to live up to have you? if this were a regular corporation that by fed gov laws did what Calif gov has done to the state there would be heads rolling and indictments in the works, it no different than a savings an lone you lone they save and spend only what is needed in the budget, with a reasonable expectation of quality services and goods in return, hello look at your representatives if they open their mouths its a lie to cover up another lie.. i know its hard to hear but open your minds and your eyes there is so much more information out there that will bring clarity to you don't live in the Calif bubble just be open minded and look beyond the feel good words from this new fed administration running things, even the devil was a smooth talker wasn't he?